The main idea is to spread the word about a book that you think is worth talking about….as long as it is not your own book!!!! In addition, I just realized that Perfect Picture Book Friday starts up again this week…Hurray! So, since I am in New Hampshire and don’t have my own computer or the time availability to post another story review (my four-year old grandson feels it is more important for me to be reading the stories to him, as opposed to reviewing them), I’m going to have this wonderful picture book do double duty. I’m thrilled to share a debut picture book by fellow 12x12er and Perfect Picture Book Friday participant…Clara Bowman-Jahn. Synopsis: A little girl celebrates her birthday with an adventure every hour. It is a basic concept book about time and clocks. We learn what Annie does throughout the 24 hours of her birthday. Why I like this book: The main character is an enthusiastic little girl with a positive attitude towards life. The wonderful illustrations help bring her character to life. Young children are fascinated with clocks…and learning about time (and time-management) is a skill kids need to master. Make a construction paper clock and use a metal paper fastener to attach the hands so that the child can change the time. Annie’s Special Day is published through eTreasures Publishing. I hope you will check it out. I’ll be flying to New Hampshire tomorrow morning…and spending the next couple of days reading, crafting and cooking with my four-year old grandson…my daughter says he has been marking off the days on the calendar and can hardly wait till I get there…neither can I!! I think I will download a copy of Annie’s Special Dayso that I can read it to him…maybe we will make one of those clocks out of construction paper. 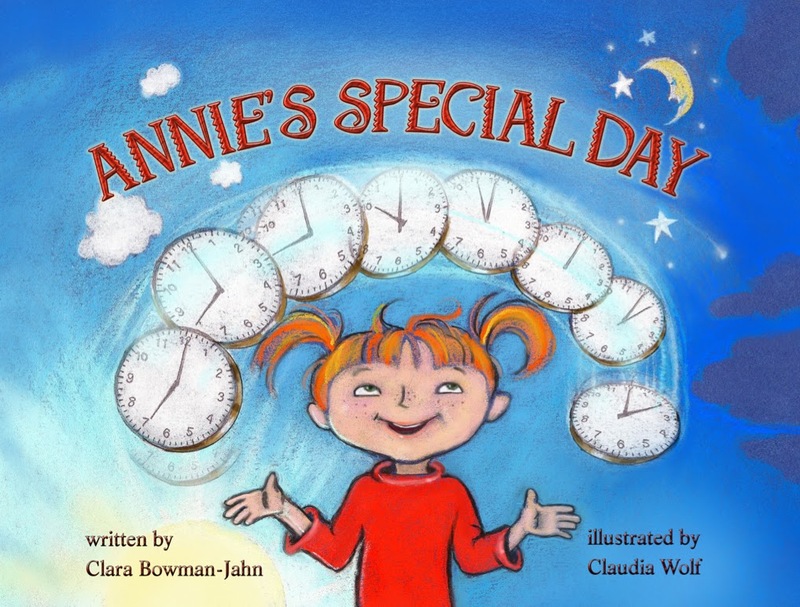 This entry was posted in Annie's Special Day, book reviews, children's author, Random Acts of Publicity and tagged children, Clara Bowman-Jahn, Picture book by viviankirkfield. Bookmark the permalink. Love this shout out. Enjoy your TIME with your grandson, Vivian! I’ve got Clar’s book and it’s wonderful! Vivian, enjoy your time with your grandson and bring back pictures of the crafts you’ll do together. Can’t wait to see them. I’m looking forward to reading Clar’s book. I like the concept of teaching kids about time, while they’re enjoying a fun book. Great review. Thank you so much, Pat! It’s wonderful to get back to PPBF…and I was thrilled to have the opportunity to review a book from one of “our own” so to speak. :) I’m limited as to what I can do for the next few days as I don’t have my own computer and most of my time is spent happily “reading, crafting and cooking” with my grandson. 🙂 I’m not able to comment on Susanna’s posts from this computer…and I’m not sure if I will be able to comment on anyone elses…it may have to wait till I get home Late Monday night. I know — create your Dot for International Dot Day. I’ve issues a challenge to bloggers to participate. This year 350,000 kids globally have signed up to make their marks on Sept. 15-ish. Have my dot done. I’m sure you’d really be creative. You can find info on my blog and FB. Great review, Vivian! It sounds like this story has so many layers – the birthday, the clock/time-telling piece, and the adventures. Have fun with your grandson! Thanks, Carrie! I just went to your blog…it is fantastic…as is YOUR review! The group is is growing…hurray!!!!! I’m having the best time with my grandson! I know, Laura…it seems quite a few people in this community are having success…it’s a lucky group I guess…oh yes…and quite talented and determined and devoted to writing the best children’s books they can!!!!! Alright! A book that will be a great resource for parents and teachers. I have to read this book! Thanks for the great review! I am amazed at how hard it is to find time concept books. This book looks invaluable for helping my kindergartener learn time. I know, Kirsten…I think kindergateners will love it…at that age they LOVE the orderliness of the time clock…what to do each hour. This sounds like a fun concept book. The idea of having an adventure every hour is like a kid friendly version of Scrooge’s ghostly visitors. Enjoy your visit with your grandson and watch out for the wild ocean this weekend! What a great way to get kids excited about learning time – connecting it to a birthday! Congratulations to Clar! Wow! Vivian! Thanks so much for this shout out! 🙂 The review makes me shine so bright I’m not sure it’s me. The comments are golden, too. I saw this on Friday when I linked my PPBF book up to Susanna’s blog but didn’t get the chance to comment then. Congrats on your radio show dear Vivian. You really have a full couple of days to get ready for and get under your belt. I am still reading the PPBF reviews, too, and just came home after a whole day of Drs appts. So glad I can put them all in one day now. Just got home…did the laundry…and all the other things that must be done when one gets back after a couple of days away! Great book to highlight! All the best to Clar with her Annie books! Thank you so much, Beth! And I am so grateful to Pat for the heads up about International Dot Day! I hope you have a wonderful visit! Annie’s Special Day is a fun read. Thank you, Stacy! It was grrrrrrreat! Sounds like Tony the Tiger. 🙂 I had so much fun…and I know that Jeremy did as well! Thank you, Jake! Just got back…will try to do the “Morning” post tomorrow. 🙂 I appreciate your encouragement! I just saw this again and wondered why there were no themes under her title. I can think of several without looking at Susanna’s blog. Concepts, friendships, school. common childhood experiences. and self esteem. I wonder If I can persuade you to make a sentence of themes as I go ask Susanna to connect them? That way your blog post about this book will have more readers. Thanks so much, Vivian. I really appreciate it.